"Chobe National Park, in northern Botswana, has one of the largest concentrations of game in Africa. By size, it is the third largest park in the country, after the Central Kalahari Game Reserve and the Gemsbok National Park, and is the most biologically diverse. It is also Botswana's first national park....The park is widely known for its spectacular elephant population: It contains an estimated 50,000 elephants, perhaps the highest elephant concentration of Africa, and part of the largest continuous surviving elephant population. The elephant population seems to have solidly built up since 1990, from a few thousand....Elephants living here are Kalahari elephants, the largest in size of all known elephant populations. They are characterized by rather brittle ivory and short tusks, perhaps due to calcium deficiency in the soils. Damage caused by the high numbers of elephants is rife in some areas. In fact, concentration is so high throughout Chobe that culls have been considered, but are too controversial and have thus far been rejected. 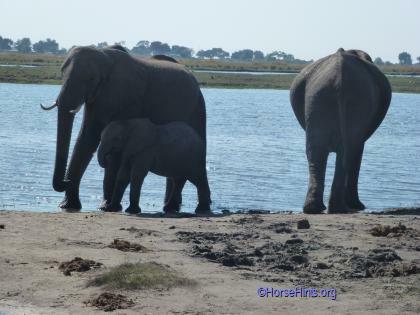 At dry season, these elephants sojourn in Chobe River and the Linyanti River areas. 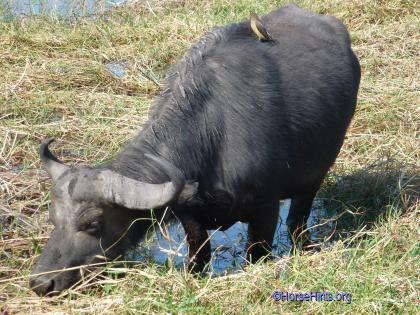 At rain season, they make a 200-km migration to the southeast stretch of the park. Their distribution zone however outreaches the park and spreads to northwestern Zimbabwe. ..."
While Bill and I were in Zimbabwe (July/dry season) we took a full day trip from Victoria Falls, Zimbabwe to Botswana. 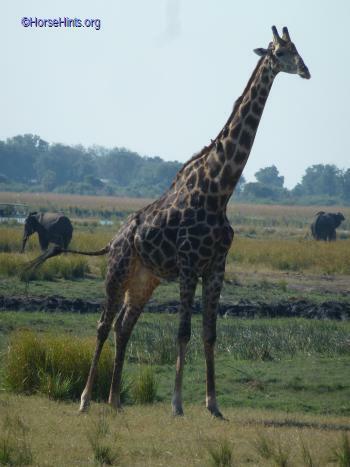 The trip included a full day excursion to the Chobe National Park in Botswana. 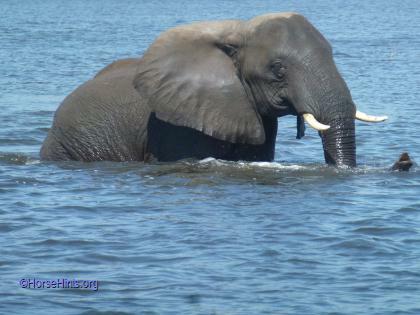 Chobe is renowned for its large elephant population. The day began with a safari boat cruise on the Chobe River. Afterwards a buffet lunch was served at the Chobe Game Lodge. The day ended with an afternoon game drive in an open vehicle. I would like to note that this game drive had more open space, like the plains, where larger herd numbers were present and the Chobe River compared to our South Africa game drives. There were lots of elephants, hippos, giraffes, cape buffalo, baboons, zebra (the National animal of Botswana), antelope of all types, and many other animals and birds, etc. 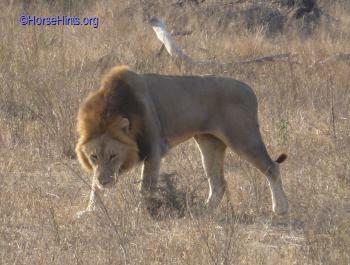 Botswana is also known for its lion population. We did see a few but at a distance. There were lots and lots of hippos in the water and on the land. I commented to my husband that I thought we had left Chris Christi back in New Jersey! 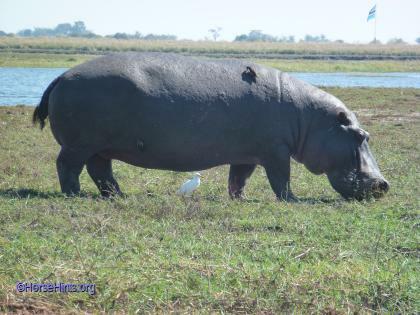 I shot this photo and captured a bird pecking away at parasites on the hippo. Yumm, yumm--tasty! If you are planning to do this you must have a double-visa and your passport. The cost of that double-visa was $90.00 US. It is somewhat of a zoo like atmosphere when you are crossing the border from Zimbabwe to Botswana. That was not particularly a pleasant experience. I suspect it depends on the day, mood of the workers, the people waiting to be processed through, etc. I thought this extension was worth doing as we were already in the vicinity. At present no yellow fever shots are needed if you are going to Botswana from Zimbabwe. It you are doing any of this from Zambia that is a different story. Check on this with the CDC if ever you plan to take this trip to see what the requirements might be at tht particular time. "A full day Safari package comprising a Cruise on the Chobe River and a Game Drive in the world famous Chobe National Park. Only an hour's drive from Victoria Falls, the Chobe National Park in Botswana is home to one of the largest game concentrations in Africa. Bordered by the banks of the breath-taking Chobe River, it is famous for its rich elephant and lion population. The tour departs daily from Victoria Falls where guests are transferred by road for 70km to the border where their Botswana guide will meet them after immigration procedures." Buffet lunch is served at the Chobe Safari Lodge. I want to note that if you are allergic to bees take precautions. We were there in July and there were bees at the Chobe Safari Lodge all over the food. They were everywhere.